There is an unwritten rule in wrestling that a wrestler has to lose his/her final match. WWE, seemingly, is following the same rule from a long time. Shawn Michaels, Ric Flair, and Mick Foley are some Superstars who had a traditional retirement match in the WWE. With the latest reports suggesting that Kurt Angle could retire this year at WrestleMania, I thought it would be great to talk about this topic. Current rumours point the finger at Drew McIntyre or Baron Corbin, who could possibly retire the Olympic Gold Medallist from in-ring competition. A retirement match, most of the time, ends the same way. The veteran loses and ties his/her boots. However, the game of wrestling isn’t so simple. Some wrestlers in the WWE retired without losing their final match. The names I am going to list below also involve wrestlers who retired without any farewell match. 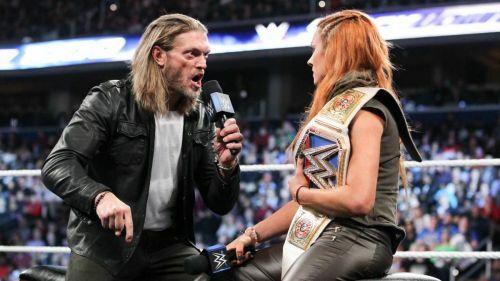 Edge is one of my all-time favourites in the WWE. He began his wrestling journey at a young age of 19. After 3 years wrestling, he joined Vince McMahon’s WWE (WWF back then) and this is where everything changed for him. Even though his initial days weren’t so bright in this company, he eventually found success, both as a single and tag team wrestler. The Rated-R Superstar, unfortunately, suffered a serious injury that ended his in-ring career. He defended his WWE World Heavyweight Championship against Alberto Del Rio in 2011, at WrestleMania 27. After that, he participated in a 10-person tag team match, which happened as a dark match on Smackdown. The match was against Del Rio, Heath Slater, Justin Gabriel, Ezekiel Jackson and Wade Barrett where the World Champion teamed up with Christian, Rey Mysterio, Big Show, and Triple H. Edge, along with other Superstars, won the match that proved to be his final match in the WWE. He announced his retirement on 11 April 2011 and became a Hall Of Fame inductee in 2012. 5 Reasons why Mandy Rose is "God's greatest creation"